Edinburgh Capitals co-owner Scott Neil has voiced his frustration at the one-game suspension handed out to player-coach Michal Dobron. Dobron is set to miss tomorrow’s home clash with Dundee Stars (face-off 6pm), following a decision by the Elite League’s Department of Player Safety (DOPS) to hand out a retrospective match penalty for “an apparent illegal check” during Edinburgh’s 6-3 defeat by Fife Flyers on Hogmanay. The check, or result of the check itself, caused an injury to Flyers’ utility player Chase Schaber. However, match referee Drew Fraser saw it as a fair hit and called no penalty on the play. Video evidence is inconclusive but it appears DOPS, after Fife asked them to review the incident, have banned Dobron purely on the evidence that an injury was sustained. An upset Neil, who has written to the league seeking further clarification said: “This news is hard to just take on the chin. I think it’s a very harsh call and the video evidence is far from conclusive. “In their statement they say it “appears to be an illegal check”. I’ve spoken to Michal and he firmly believes it was a clean hit, shoulder to shoulder. I’ve gone over the video evidence frame by frame and you can’t determine the point of contact on the hit. It is unfortunate that a player has been hurt, but it is perfectly feasible to be injured as a result of a clean check, and the referee who saw the incident didn’t even call a two-minute minor penalty. “Part of the frustration is, and I have now made a representation to the league, we weren’t even told what this incident was and we weren’t allowed to give our side of the story. There are always two sides to an incident like that and here you have a player who has no or very little history of illegal checks, and a referee who deemed it was a fair hit. Edinburgh may well have strong grounds to be aggrieved. However, despite Neil’s protestations, the ban will surely stand as DOPS rules dictate only suspensions of two games or more can be appealed. Bottom-of-the-league Edinburgh, halfway through their 52-game season, five points out of a play-off place and without a win in seven games, badly need to turn things around, and would have seen this weekend’s two matches against second-bottom – and an equally out of form – Dundee, as their best opportunity to do so. 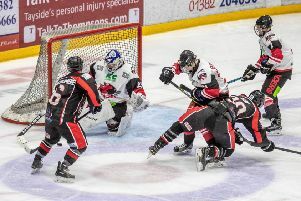 Edinburgh netminder Travis Fullerton has recovered from a bout of flu that kept him out of the Fife defeat and Monday’s 4-2 loss at Nottingham Panthers, and will return to the line-up, plus Latvian defenceman Rihard Grigors is available for selection after returning from a two-match ban for checking to the head. However, Dobron, a key member of the Capitals blue-line, will be a big loss. On his own suspension, Dobron said: “It’s a decision the league have made and one I have to accept. I only hope the boys go on and win without me. “It’s a very important two games against Dundee. We need to get back in touch with the play-off places. We have five points to make up and we need to start winning games. “Travis was back yesterday at practice and I think he will be ready for the weekend, and I believe he really can be a big help to us.